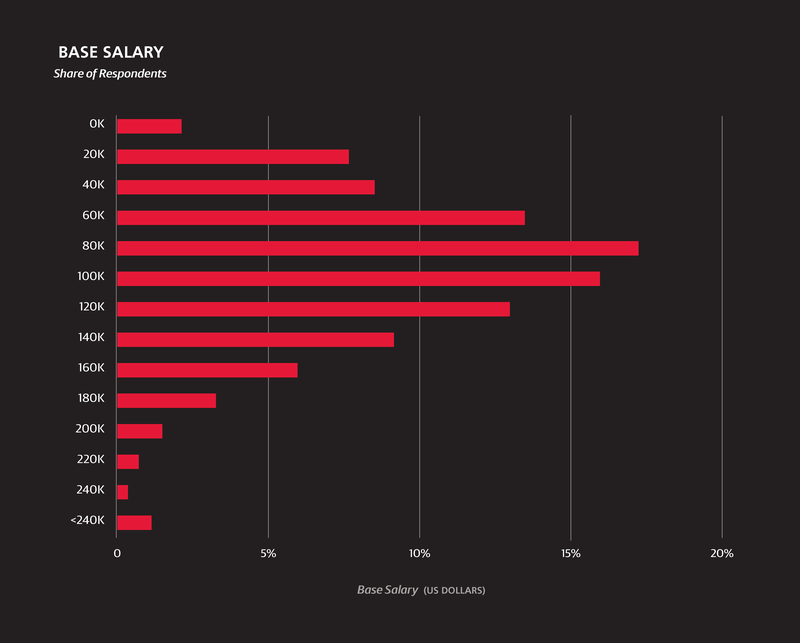 For the third year running, we at O’Reilly Media have collected survey data from data scientists, engineers, and others in the data space about their skills, tools, and salary. Some of the same patterns we saw last year are still present—newer, scalable open source tools in general correlate with higher salaries, Spark in particular continues to establish itself as a top tool. Much of this is apparent from other sources: large software companies that traditionally produced only proprietary software have begun to embrace open source; Spark courses, training programs, and conference talks have sprung up in great numbers. But who actually uses which tools (and are the old ones really disappearing)? Which tools do the highest earners use, and is it fair to attribute a particular variation in salary to using a certain tool? 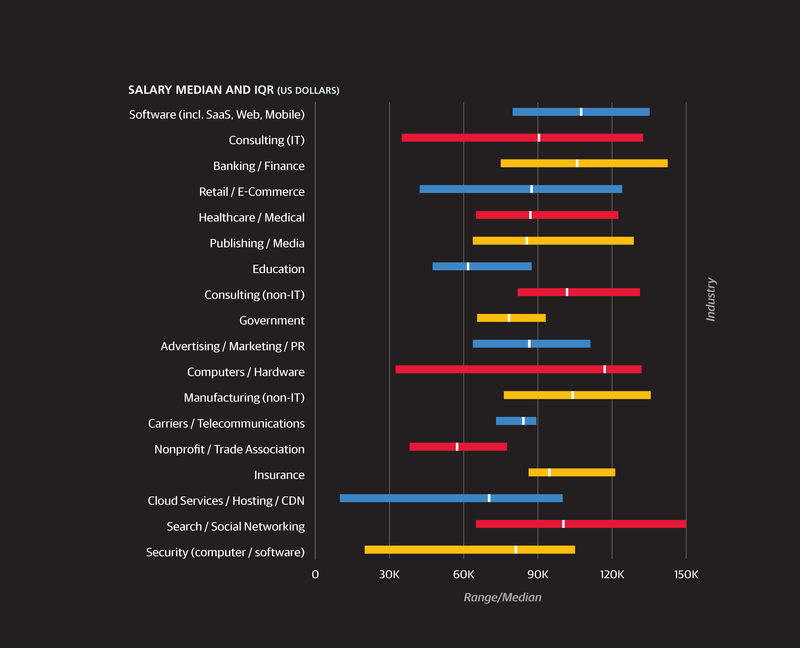 We hope that the findings in this iteration of the Data Science Salary Survey will go beyond what is already obvious to any data scientist or Strata attendee. This report is based on an online survey open from November 2014 to July 2015, publicized to the O’Reilly audience but open to anyone who had the link. Of the 820 respondents who answered at least one question, about a quarter dropped out before completing the survey and have been excluded from all segments of analysis except for those showing responses to single questions. We should be careful when making conclusions about survey data from a self-selecting sample—it is a major assumption to claim it is an unbiased representation of all data scientists and engineers—but with a little knowledge about our audience, the information in this report should be sufficiently qualified to be useful. As is clear from the survey results, the O’Reilly audience tends to use more newer, open source tools, and underrepresents non-tech industries such as insurance and energy. O’Reilly content—in books, online, and at conferences— is focused on technology, in particular new technology, so it makes sense that our audience would tend to be early adopters of some of the newer tools. A final word on the self-selecting nature of the sample: differences between results in this survey and other surveys may simply arise from the samples’ idiosyncrasies and not from any meaningful difference. Findings from other salary survey reports—there have been a few recently in the data space—sometimes conflict directly with our findings, but this doesn’t necessarily imply that one set of findings are erroneous. 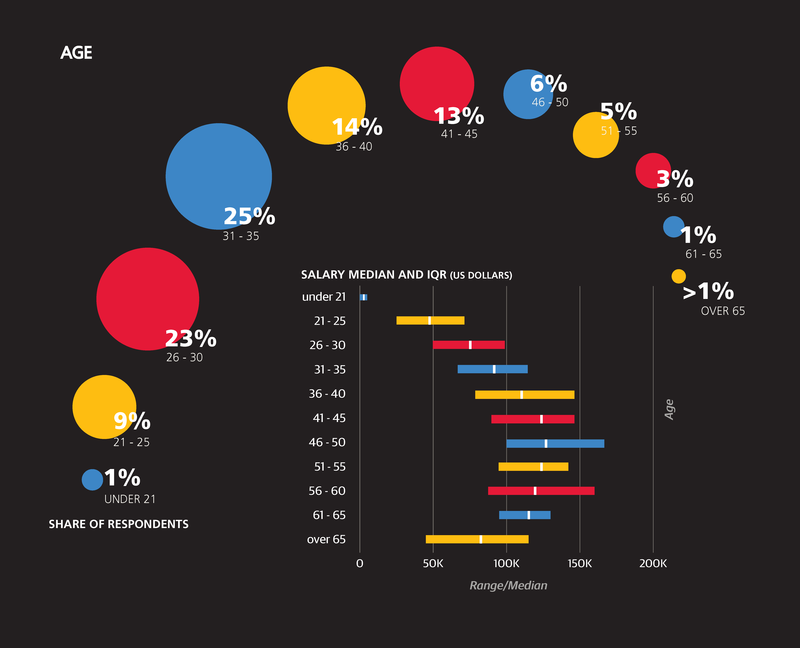 Likewise, discrepancies between our own salary surveys don’t necessarily imply a trend. The methodology between this year’s survey and last year’s is close enough to allow us to make some conclusions based on year-to-year differences, but only when the numbers are very strong. Before we discuss salary we should describe who exactly took the survey. Despite the fact that this is a “data science” survey, only one-quarter of the respondents have job titles that explicitly identify them as “data scientists.” Of course, it is debatable how much meaning can be assumed simply from a job title—more on that later—but it’s safe to say that the data science world is inhabited by people who call themselves something else: by job title, 14% of the sample are analysts, 10% are engineers (usually “data,” “software,” or “analytics” engineers), 6% are programmers/developers, 3% are architects (of various kinds), 4% are in the business intelligence sector, and 1% are statisticians. Management is also present in the sample: managers (9%) and directors (5%) are the most significant groups, with a handful of VPs, CxOs, and founders as well. The rest of the sample comprised mostly of students, postdocs, professors, and consultants. Judging by the tools used by the sample, the vast majority—even the managers—had some technical side to their role, regardless of job title. Beyond job title, the sample includes respondents from 47 countries and 38 states across multiple industries, including software, banking, retail, healthcare, publishing, and education. Two-thirds of the survey sample is based in the US, and compared to its share in population, California is disproportionately represented (22% of the US respondents, 15% of the total sample). 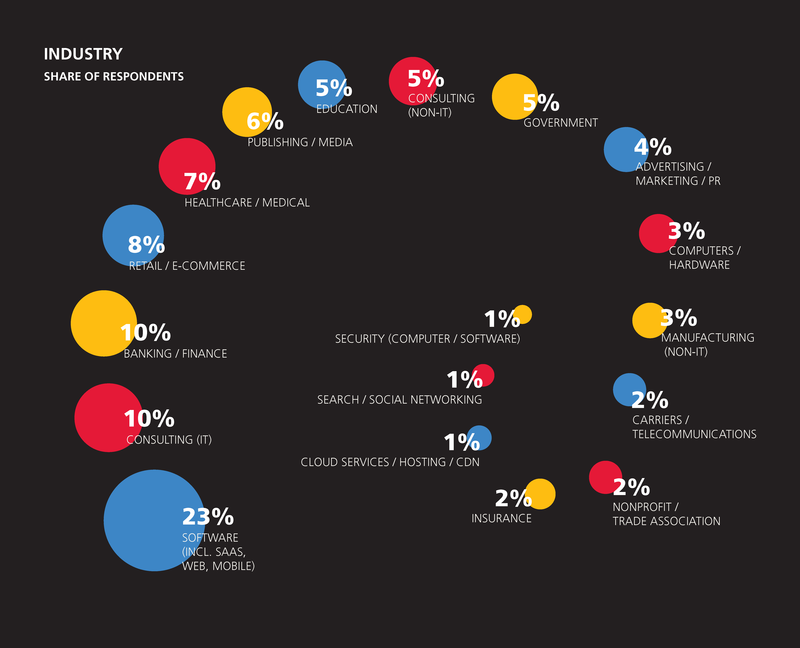 The software industry’s 23% share is the largest among industries, and this excludes other “tech” industries such as IT consulting, computers/hardware, cloud services, search, and (computer) security; when considered in aggregate, these account for 40% of the sample. A third of the sample is from companies with over 2,500 employees, while 29% comes from companies with fewer than 100 employees. One-third of the sample is age 30 or younger, while less than 10% is older than 45. In terms of education, 23% of the sample hold a doctorate degree, and 44% (not including the PhDs) hold a master’s. Many respondents reported to be a “student, full- or part-time, any level”: aside from the 3% who gave job titles indicating full-time study (usually at the graduate level), 15% of the sample—data scientists, analysts, and engineers—said they were students. Two-thirds of respondents had academic backgrounds in computer science, mathematics, statistics, or physics. Starting at a base salary of $70,577, we add $1,467 for every year of age past 18 (so the base for a 48-year-old is $114,587). 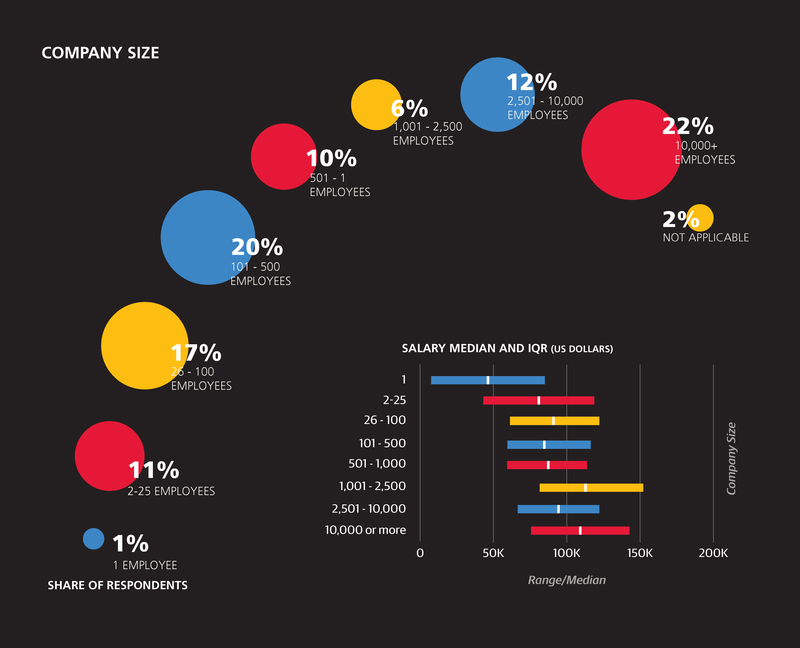 Salaries at larger companies tend to be higher—add another $401 if your company has more than 3,000 employees, but subtract $3,468 if it has fewer than 5005—and the software industry is the only one to have a significant positive coefficient. Education has a negative coefficient—presumably, these are largely respondents who work at a university. Those in upper management take home an average of $32,000 extra in their base salary. Just as in the 2014 survey results, the model points to a huge discrepancy of earnings by gender, with women earning $8,026 less than men in the same locations at the same types of companies. Its magnitude is lower than last year’s coefficient of $13,000, although this may be attributed to the differences in the models (the lasso has a dampening effect on variables to prevent over-fitting), so it is hard to say whether this is any real improvement. In terms of geography, the top-earning locations are California (+$16,000) and the Northeast (+$12,000; from NY/NJ into New England), while the rest of the country, as well as UK/Ireland and Australia/NZ, are estimated to be roughly equal. The rest of Europe, meanwhile, is much lower (–$23,000), not far off from Asia (–$26,000) and Latin America (also –$21,000). 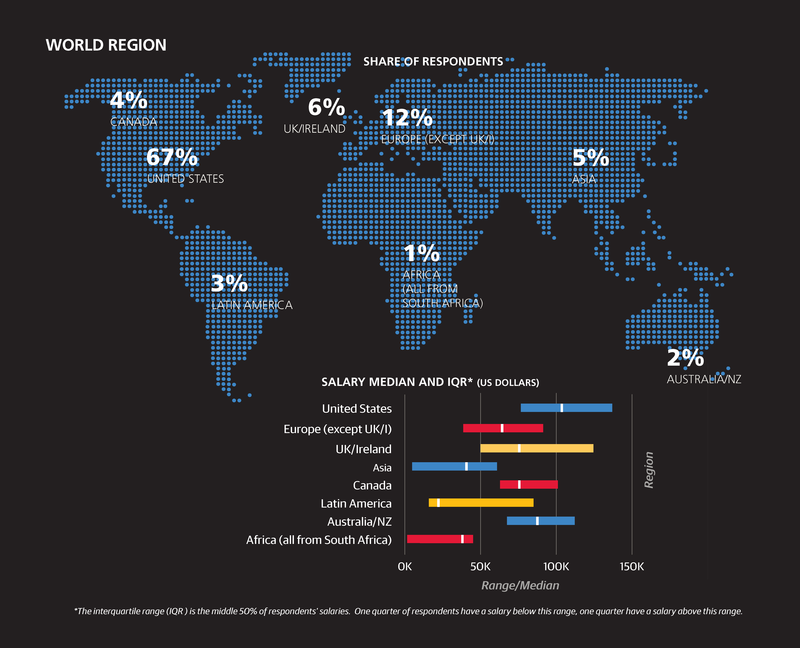 Making reliable distinctions in salary between countries, as opposed to the continental aggregates, is not possible due to the relatively small non-US sample. According to this model, a PhD is worth $7,500 (each year) to a data scientist. As for a master’s degree—its estimated contribution to salary was not significant enough for the algorithm to make it into this first model. 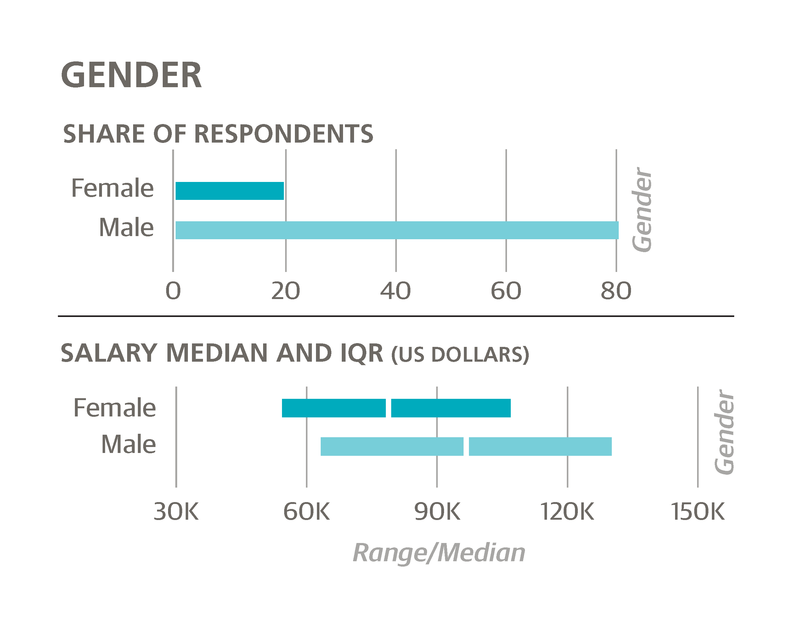 1Throughout the report we use base salary; in the past we have also reported total salary, but find total salary is error-prone in a self-reporting online survey. Salary information was entered to the nearest $5,000, but quantile values cited in this report include a modifier that estimates the error lost by using rounding. 2“Effect” is in quotations because without a controlled experiment we can’t assume causality: particular variables, within a margin of error, might be certain to correlate with salary, but this doesn’t mean they caused the salary to change, quite relevantly to this study, it doesn’t necessarily mean that if a variable’s value is changed someone’s salary would change (if only it were so simple!). However, depending on the variable, the degree of causality can be inferred to a greater or lesserextent. 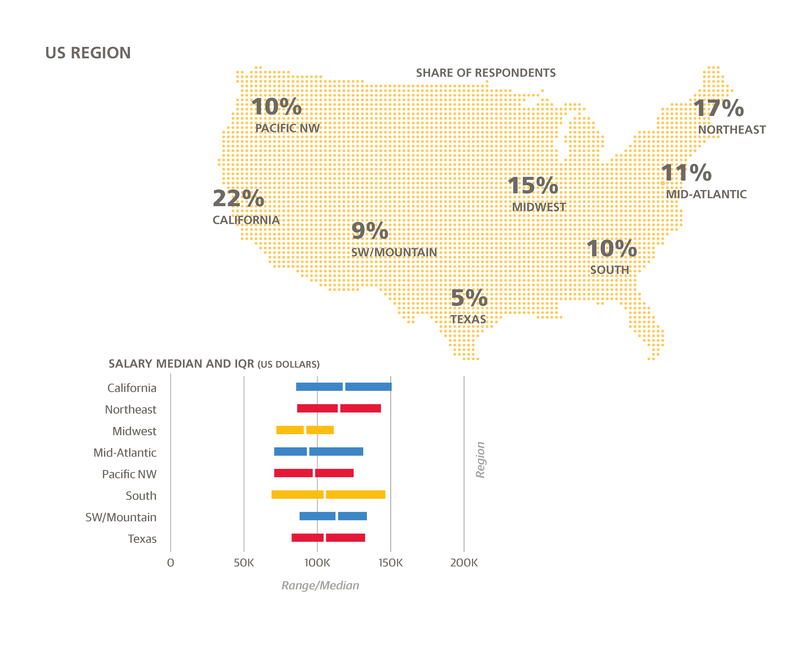 For example, with location there is a very clear and expectable variation in salary that largely reflects local economies and costs of living. If we include the variable “uses Mac OS,” we see a very high coefficient—people who use macs earn more—but it seems highly unlikely that this caused any change in salary. More likely, the companies that can afford to pay more can also afford to buy more-expensive machines for their employees. 3We should note that there are multiple variables corresponding to “student”. The group that are excluded from (all) of our salary models are the 3% that identify primarily as a student, that is, this is their job title. This group includes doctoral students and post-docs. These respondents, if they had any earnings at all, reported salaries of up to $50,000, but the nature of their employment seems so far removed—certainly in terms of how pay is determined—that it seems best to remove them from the model entirely. A second group of “students” are the ones who replied affirmatively that they are “currently a student (full- or part-time, any level)”, and was 17% of the sample: most of these “students” are also working at non-university jobs, and are kept in the model. 4The lasso model is a type of linear regression. The algorithm finds coefficients that minimize the sum squared error of the predicted variable plus the sum of absolute values of the estimated coefficients times a constant parameter. For our models, we used ten-fold cross validation to determine an optimal value of this parameter (as well as its standard deviation over the ten subsets), and then chose the parameter one-half standard error higher for a slightly more parsimonious model (choosing a full standard error higher, as is often practiced, consistently resulted in extremely parsimonious and rather weak models). The R2 values quoted are the average R2 of the ten test sets. Since the final model is trained on the full set, the actual R2 should be slightly higher. 5This should be qualified, however, that this is base salary: the earnings of startup employees include speculative amounts that could, on average, reverse this coefficient; as previously mentioned, since this is hard to measure we are sticking to base salary for the sake of even comparison.